The NRC requires U.S. nuclear power plants to be able to shut down safely in the face of many extreme events – tornados, hurricanes and earthquakes. But the NRC also takes into account far more unusual events, like solar flares and electromagnetic pulse (EMP) caused by a certain type of nuclear weapon. Both can affect generators, transformers and other parts of the electric grid – which in turn could affect nuclear power plants. The NRC has been examining these issues for more than 30 years, starting in the late 1970s when the agency studied how EMP could affect nuclear power plant safe-shutdown systems. In February 1983 the NRC issued the study’s conclusion: nuclear power plants’ safety systems can do their jobs after an EMP event. The agency revisited the issue in 2007 to account for the increasing use of digital computer systems in nuclear plants, which potentially could be more susceptible to EMP. The agency continued to conclude as recently as two years ago that nuclear power plants can safely shut down following an EMP event. 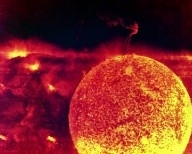 The NRC has also examined potential “solar storms” and their potential to damage the electric grid. A strong geomagnetic storm on March 13, 1989, for example, severely disrupted electrical power equipment in Canada, Scandinavia, and the United States. After studying the event the NRC issued an Information Notice in June 1990, to ensure nuclear power plants understood how severe solar activity could affect transmission systems and other components of the power grid. Additional research in 2010 analyzed and compared solar or geomagnetically-induced current events to those of the EMP events previously analyzed. This work led to the same conclusion as the EMP studies – U.S. nuclear power plants can safely shut down if a solar storm disrupts the grid. The edge of the NRC’s authority lies in a nuclear power plant’s electric switchyard, where our rules mesh with those of the Federal Energy Regulatory Commission, which oversees the nation’s electric grids. Another body, the North American Electric Reliability Corporation (NERC) develops and enforces grid reliability standards. The NRC works closely with FERC and NERC on grid reliability issues, including the effects of solar or geomagnetic storms and EMP. Earlier this year a citizen petitioned the NRC to revisit the issue of grid disruption, this time focusing on the spent fuel pools at U.S. nuclear power plants. The petition calls for a new rule that would require nuclear power plant spent fuel pools to have emergency systems capable of functioning for two years in the absence of an operating electric grid. The NRC is currently analyzing dozens of public comments on the petition, and the agency expects to issue a decision on the petition in the middle of next year. If you’re interested in more details, look at the letter the NRC sent Congress last month. Its hard to imagine the world if the nuclear plants were hit by any natural calamities. The after effects will be very much adverse and cannot withstand anymore. Its better to take preventive measures and shut those which are under the line of fire! In Indonesia there are no nuclear power plants so safe just not bothered with electrical pulses. I agree with the poster above. The NRC says that it has contracts with local fuel suppliers to get more fuel to emergency generators if on site supplies are exhausted. That is very troubling considering the plant in Nebraska that was flooded was 88 hours from spent fuel pool boil when it lost power, and the temperature in the pool rose 3 degrees in under an hour. How long do you think those fuel contracts will be honored in the event an attack or disaster destroys large parts of the power grid? Once the power is out all bets are off. After the power has been off two weeks and someone shows up at the fuel company with a bucket of corn($3000 in today’s money) for a gallon of the nuclear plant’s gas who do you think is getting the fuel? I hope this never comes to pass but it is defiantly in the realm of high probability. Hindsight is 20/20 but it boggles my mind how these plants were ever constructed if they can’t survive being without power. The NRC must force the power companies to install technologies that will allow SFP cooling until the spent fuel is cool enough that it will not cause a boil. These fixes must be onsite, anything else is futile! It is important to keep nuclear reactors over protected. It is a good thing the NRC is closely looking at this problem. I am very pleased to see the NRC seems to be taking this issue seriously. While, the disruption of the power grid is something that is very disturbing for most people to contemplate, most studies suggest that US power infrastructure is HIGHLY vulnerable to disruption due to power surges and cyber attack. Most government/scientific studies indicate that the US will experience a powerful, possibly grid destroying, solar storm with-in the expected life cycle of our current nuclear reactors. This is completely independent of the threats of cyber attack or intentional nuclear EMP attack. Several nations are known to have these capabilities; all that is lacking is the will to use them. All US nuclear plants must be able to withstand extended power outages with NO RESUPPLY OF FUEL to emergency generators. You stress that the NRC’s authority ends at the transmission lines going into the plants. However, you are responsible for the safety of the public from nuclear plants. You admit that you cannot control what happens to the electric grid, therefore, you must institute technologies ONSITE at plants that will allow them to withstand extended blackouts with no resupply of fuel or outside assistance. If you cannot guarantee outside power then you must assure that your plants can withstand such an occurrence. If your “extensive study” of EMP effects have focused on what can be expected in wider society during such an event you should realize outside assistance is doubtful. Most authorities won’t even think about your plants till they start getting reports that the spent fuel pools have boiled off and are on fire. It is good to see that you are seriously considering the Popik Petition that you link too. I noticed that all of the comments, nearly 100 of them, on the petition were positive……except for the one from the nuclear industry “trade” organization (cough, cough, corporate front group) the Nuclear Energy Institute. I hope that you will give the same consideration to the public comments, many of them from nuclear workers, which you give to the one negative corporate comment. I’m sure you are aware of the accusation that the NRC is a “captured” agency under the control of the corporations that you are suppose to regulate. The revolving door between NRC regulators and the nuclear industry seems to support this claim. However, I’m sure that it is just co-incidence and the NRC will use common sense and require these changes be made even in light of nuclear industry opposition. It is troubling that the nuclear industry seems to put costs above public safety, but then when you consider that their liability is limited in the event of an accident it is no surprise. In closing, I strongly urge the NRC to make all of its plants able to survive extended (up to two year) power outages. Whether they are caused by solar flare, EMP, or cyber attack, the results will be the same no power to cooling systems and SFP’s. Here are before and after photos from a cyber “accident” at a power generating station in Russia. The plant was off line and a technician 500 miles away restarted it remotely over the internet. I leave this for your consideration.